Oscar nominated actress Gloria Stuart began acting in the 1930s. However, she was probably best known for her role as 101 year old Rose in the 1997 movie Titanic. Stuart did a number of movies in the 1930s and 1940s before taking a 3 decade break from acting from the mid 1940s to the mid 1970s. It was during this break from acting that Stuart began painting. In her 1999 book I Just Kept Hoping, she says that it was on a 1954 trip to Paris to visit her daughter, where she saw the works of Impressionist and Postimpressionist painters such as Monet, Manet, Seurat, Fantin-Latour, and Degas, that she was inspired to become a painter. Seeing those paintings for the first time sent me into near Hysterics. Having paused forever in front of each canvas on the way, looking at Rousseau’s Sleeping Gypsy at the end of the first gallery, I burst into tears. The end result of this happening was my resolve to become a painter. I knew I could do it! Stuart’s first of many shows was in 1961 at Hammer Galleries in New York City. It sold out, according to her book. Stuart says in the book that the subject of her two most important accomplishments is the Watts Towers, referring to the towers built by Italian immigrant Simon Rodia the Watts community in Los Angeles. She says that the large canvases took about three years of very detailed painting. These paintings are now in the permanent collection of the Los Angeles County Museum of Art (LACMA). Prints of the paintings are available for sale in the LACMA store. She said that her favorite subject in figure drawing was Adam and Eve in the Garden of Eden. She says that she did three very large versions. 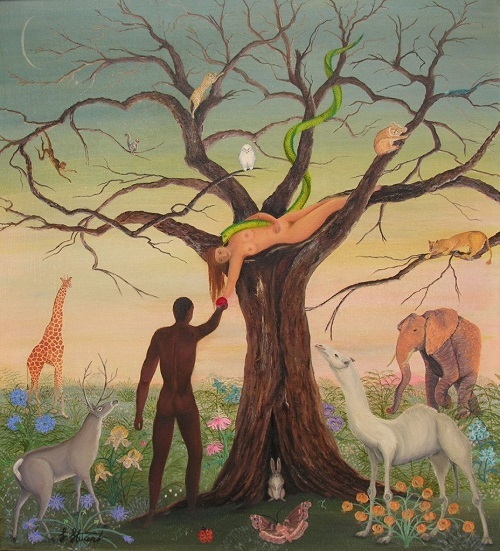 In the first, a black Adam is taking the apple from a white Eve. One of these paintings is currently available for sale at 1stdibs. Adam and Eve by Gloria Stuart, 1965. This was written by Lorrie. Posted on Saturday, March 30, 2019, at 5:52 pm. Bookmark the permalink.